Editor’s Note: This article is drawn from a “Crossing the Lines” post, found HERE. Take a look at Drexel’s three newest buildings: the recently-opened Papadakis Integrated Sciences Center, and the forthcoming LeBow and American Campus Communities buildings. All three share common characteristics: white stone façades, combined with strongly formal Modernism; Papadakis and LeBow also share vertical windows and accents. These are elements associated with a late 1950s through 1970s design style called Brutalism, responsible for some of the ugliest buildings today marring our city: at least one blog devotes a weekly column to such buildings. Rare is the Brutalist masterpiece–perhaps only Louis Kahn and I.M. Pei successfully made it work. Worse still, the social upheaval of the 1960s bought a new design emphasis on securitization; these structures were quite literally fortresses of concrete. To say a building is Brutalist implies that it is either passively or actively unsightly. But look closer. While much Brutalism relied on the fortress metaphor–overscaled, antihuman, and intimidating–at the street level, these projects are very different. Walls of glass. Multiple sidewalk uses. Eye-catching details at the pedestrian level. These buildings look Brutalist, but hardly are, in a certain sense. It is as if Drexel is knocking down the fortress door. Together, these buildings will make an excellent counterpoint to the upper campus’ avant-gardism, manifested most strongly in the Daskalakis annex and Erdy-McHenry’s Race Street and Millennium Halls. Moreover, Brutalism was always at its best when realized in limestone, which lends an aura of gravitas to whatever style it’s used for, from Beaux-Arts classicism to Art Deco ornamental modernism and on to midcentury Moderne–and finally Brutalism. This dignity is fully appropriate for a campus heart, and contrasts charmingly with the upper campus’ Bauhausian playfulness–but quite poorly with the ugly and increasingly dated original academic orange-bricked Brutalist buildings that have defined Drexel’s style for so long. 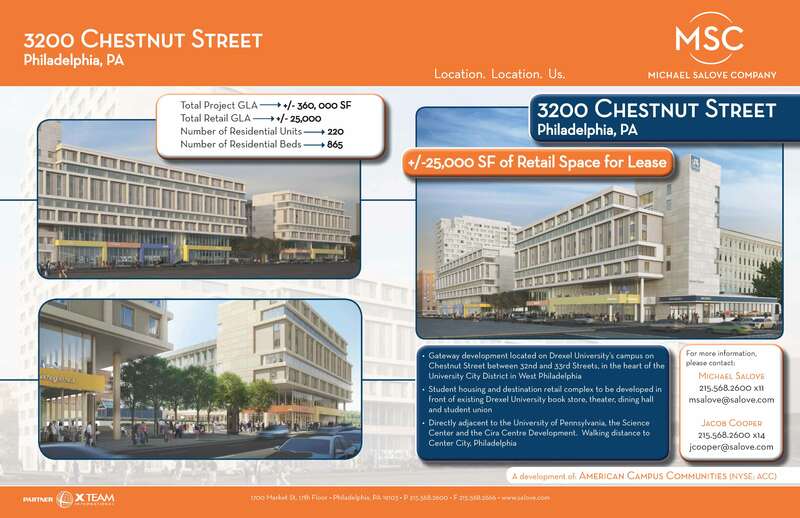 That 3200 chestnut plan is horrendously awful. I think I’d rather have the orange brick crud that’s already there. They should have placed it on the 3001 block of chestnut or the 3101 block of market. They can afford it. I agree 3200 Chestnut is hardly handsome–it has a Centre Square-ish look to me–but interactiveness at the street is a more primary determinant of urbanism. (Centre Square is urban; the MSB is not.) And frankly, that lawn was boring and I do not believe much used by students. One thing I do note for sure is that the ugliness of the orange brick is amplified by the new limestone concoctions going up.